April 9, 2019 | Tysons Corner, VA Offit Kurman’s mergers and acquisitions (M&A) team, led by attorney Michael Mercurio, is continuing its record-breaking streak of successful transactions successfully closed for clients. First, Mr. Mercurio represented Jules Hendrix, an insurance agent based in Middletown, Delaware, in her purchase of Crow Insurance Agency, Inc. For years, the Crow Insurance Agency has helped clients throughout Delaware and the surrounding region identify and meet their insurance needs. 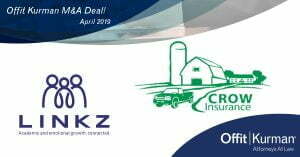 The agency’s specialties include insurance policies and financial products in the categories of business, farm/agribusiness, crop, home, auto, boat, RV, motorcycle, life, health, and long term care coverage. 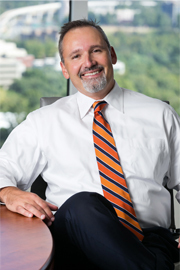 Second, Mr. Mercurio represented LINKZ, LLC in its purchase of Bowman Educational Services, Inc. Founded in 1983, Bowman Educational Services has provided tutoring and support for students of all ages, with a focus on helping students with dyslexia, ADHD, executive dysfunction, and dysgraphia, as well as individuals with difficulties in math, speech, and language. LINKZ serves the same student populations, as well as learners who need advanced test preparation, college and career counseling, educational diagnostics, and other specialized services centered on academic and emotional growth. Bowman Educational Services founder Jake Ferentz, M.Ed. has joined LINKZ as its director and CEO. These transactions are just two of many Mr. Mercurio and the rest of Offit Kurman’s M&A team have helped close for clients over the past year. To learn more about the current M&A market, see a recent recap of deals closed, and get in touch with an Offit Kurman M&A attorney, visit offitkurman.com.